Princeton University Press, 9780691173429, 376pp. Our democracy today is fraught with political campaigns, lobbyists, liberal media, and Fox News commentators, all using language to influence the way we think and reason about public issues. Even so, many of us believe that propaganda and manipulation aren't problems for us--not in the way they were for the totalitarian societies of the mid-twentieth century. 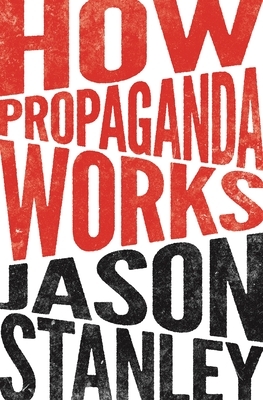 In How Propaganda Works, Jason Stanley demonstrates that more attention needs to be paid. He examines how propaganda operates subtly, how it undermines democracy--particularly the ideals of democratic deliberation and equality--and how it has damaged democracies of the past. Focusing on the shortcomings of liberal democratic states, Stanley provides a historically grounded introduction to democratic political theory as a window into the misuse of democratic vocabulary for propaganda's selfish purposes. He lays out historical examples, such as the restructuring of the US public school system at the turn of the twentieth century, to explore how the language of democracy is sometimes used to mask an undemocratic reality. Drawing from a range of sources, including feminist theory, critical race theory, epistemology, formal semantics, educational theory, and social and cognitive psychology, he explains how the manipulative and hypocritical declaration of flawed beliefs and ideologies arises from and perpetuates inequalities in society, such as the racial injustices that commonly occur in the United States. Jason Stanley is the Jacob Urowsky Professor of Philosophy at Yale University. He is the author of Knowledge and Practical Interests, Language in Context, and Know How.